There were more trees in Connecticut in 2010 than there were at any time since 1850. This, of course, reflects different land use patterns that have emerged as the state’s economy has evolved. 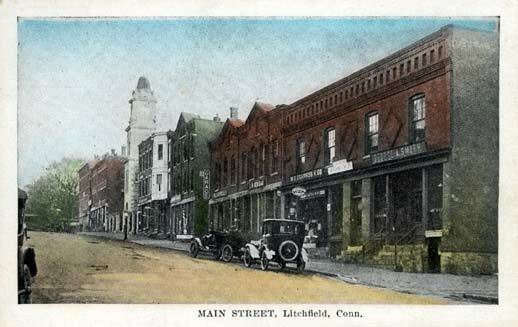 In Litchfield County this is also a result of the willingness of residents to conserve rather than develop their land. The Orzech Family Preserve, 112 acres near Route 67 and the Shepaug River in Roxbury. This carving on a boulder in the White Memorial Foundation honors Alain and May White. Alain and May White were among the most extraordinary conservationists in the county. In addition to their own 4,000 acre preserve (what is now the White Memorial Foundation), the siblings additionally donated nearly 6,000 acres to fourteen Connecticut state parks, mostly in Litchfield County. The Macricostas Preserve of Steep Rock, along Route 202 in Washington. A similar operation to the Whites was taking place in Washington, where noted architect Ehrick Kensett Rossiter made the Steep Rock Land Trust his most lasting legacy to the town. Rossiter began with a 100-acre purchase in 1881 – what would become the heart of the preserve – and continued to add land to the trust he established. Additional donations from the Van Sinderen and Macricostas families have brought Steep Rock’s holdings to nearly 3,000 acres. The Morosani Preserve in Northfield. The examples of the Whites and Rossiter are matched in spirit if not in size by dozens of more conservationists who have helped to preserve the county’s landscape. Among these are the Morosanis, whose Laurel Ridge Foundation is noted for its daffodils every spring, Edith Morton Chase, daughter of a brass magnate whose home became Topsmead State Forest, and S. Dillon and Mary Livingstone Ripley, whose Kilvarock estate became the Livingstone Ripley Waterfowl Conservancy.